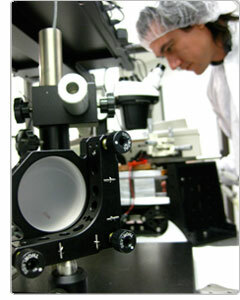 AdTech Optics has been developing and producing innovative QC lasers since 2005. QCLs, first invented at Bell Labs in 1994, are capable of infrared emission in the mid-wave and long-wave IR spectral range (λ=3.5-25μm), and more recently, have been used to generate THz frequencies. They differ from traditional semiconductor diode lasers in that they do not use a p-n junction for light emission. Multiple active regions are "cascaded" so that each injected electron can emit multiple photons and therefore enhance laser gain. Each active region is composed of a multi-layered semiconductor material structure designed to have an electronic band structure which gives the desired emission wavelength, and is manufactured with nanometer-level thickness control. AdTech's QCLs are designed to cover most of the mid-infrared spectral range, λ=3.8μm to λ=12.5μm, and to achieve high power and high efficiency at specific wavelengths of particular importance. Almost allof AdTech's QCLs operate continuously at room temperature and can be designed to work at a single frequency by use of distributed-feedback waveguide fabrication. AdTech's devices are fabricated using all the platform technologies available for conventional diode lasers and therefore rely on decades of development for semiconductor technology in telecom/datacom applications. Our QC lasers are generally built with InP-based materials, widely used in the optoelectronics industry. AdTech’s lasers are edge-emitting devices that can be mounted in packages similar to most well-known configurations used for telecom/datacom lasers such as C-mounts, CS-mounts, high heat load (HHL), butterfly, TO-can, etc. AdTech optics has selected MOCVD as the technology of choice for its growth of semiconductor materials. The advantages over alternative techniques include the high growth rate, the possibility to fabricate buried heterostructures for enhanced thermal dissipation, and the stability over long runs. MOCVD is a platform technology that enables industrial volume production of high quality semiconductor lasers. 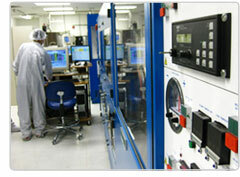 Our surface quality and wafer uniformity are comparable with the state-of-the-art in the industry. QCLs are inherently more robust than diode lasers because they are not based on a p-n junction for their operation. AdTech's lasers have demonstrated continuous, stable room temperature operation over several years, and today are being deployed in systems for various applications, ranging from defense, security, environmental, health, and analytical systems. We fully characterize our QCLs before their deployment and have proven thousands of hours of operation from our devices. AdTech Optics works with its customers to find the most suitable solutions depending on the customer’s application needs. Many important molecules have their strongest absorption resonances in the mid-infrared region of the electromagnetic spectrum. AdTechs’ QC lasers can be designed to cover any region in the entire mid-IR spectrum, and therefore they are the ideal tool to identify chemicals, gases, liquids, contaminants, hazardous materials, pollutants, etc., even in trace quantities. AdTech Optic's QC lasers are operated in the same way as common diode lasers; they only require different bias conditions, for example higher voltages. Please refer to sample spec sheets for details. AdTech Optics can assist its customers with selection or design of the lasers tailored to their application needs, based on our extensive experience in laser design, growth, fabrication and packaging.